Arthur Rosenhammer, Paul Greifzu, Rudi Krause, Hans Klenk, Ernst Klodwig, Rudolf Ortschitt, Kurt Straubel? DAMW 1951, Greifzu-BMW 1951, Reif-BMW, Veritas Meteor, Heck-BMW, DAMW 1951, Straubel-BMW? With the availability of the BMW 328 engine on both sides of the iron curtain Formula 2 racing was not restrained to the Western part of Germany but also blossomed up in the GDR for a few years in the early fifities. This picture is perhaps one of the best possible means to sum up this short but exciting period, as the grid here at the Autobahnspinne at Dresden-Hellerau in 1951 covers all the essential aspects: From the state-supported entries of the Rennkollektivwagen to a variety of home-built BMW specials with the occasional West German guest (Hans Klenk's Veritas Meteor Streamliner) in between. Fortunately for posterity the East German authorities recognized early on the potential of racing drivers as integration figures to represent the virtues of their new socialist society. Therefore quite a lot of literature was produced about these new idols so that life and career of drivers like Rosenhammer, Greifzu and Krause are comparatively well documented today, of course with certain reservations regarding the extremely positive style in which their respective biographies are written: Legends full of chivalry and true sportsmanship, with a strong over-accentuation of the achievements of their stars and of course accompanied by a good share of anti-capitalistic morality and the occasional propaganda slogan. 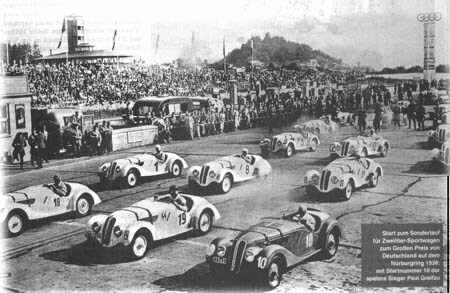 A whole field of BMW 328s forming for the start of the 2-litre sports car class during the Grand Prix weekend at the Nürburgring in 1938. The dark No.10 car at the front is that of later winner Paul Greifzu. One name certainly excels within the group of German special builders, regardless of whether they hail from the West or the East: Paul Greifzu. The reason for that is not only the fact that he could be regarded as the prototype of a sports amateur in the word's truest spirit, but also because he was the only driver who ever won a major race with a home-built car that he had developed all by himself - together of course with his faithful mechanic, Otto John, who had accompanied him throughout his career. If we can believe Greifzu's biography he seems to have been nearly free of allures and escapades, unlike so many other drivers before and after, a honourable, modest and indigenous person – a real "prototype" German of his time: Spending his whole life at Suhl, a small provincial town in the heart of Germany, where he absolved a profound mechanic's education before he founded a family (wife and two daughters) and took over his father's workshop. With machinery and engines always playing a dominant role in his life it was only a small step for him to go racing. Like most of his contemporary drivers he had started initially with motorcycles during the twenties before he devoted himself to sports cars, specialising himself on hillclimbs. When BMW began serial production of the famous 328 model in 1937 Greifzu was one of their first customers and his car was delivered in time for a busy, but also quite successful first season. The next year turned out to be even better, when Greifzu became the shooting star of the scene when he drove to a convincing win in the German Grand Prix for sports cars. At that time he had been joined by Otto John, who had already been employed in the workshop of Greifzu's father, and together they had done the engine and car development nearly all by themselves. This of course increased the impression he made on the experts, his success at the Nürburgring being not only proof of his driving ability, but also of his high talent as a mechanic, as this victory was achieved against a strong field of works-maintained sister cars. After that the war interrupted his promising career, but Greifzu succeeded in hiding away his precious BMW from being confiscated. So as soon as the Russian government of the Eastern occupation zone allowed the first races to be held again in the summer of 1949, at Dessau and at the Sachsenring (near Hohenstein-Ernstthal) he was was able to come back to the tracks instantly, now already aged 47. In both events he not only had to face the newest cars from the Eisenach factory but also strong opposition from West Germany, where there was already a three-year advantage in development time. Hence especially at the Sachsenring the old faithful BMW turned out to be much too high-legged and heavy to be competitive and Greifzu realized he would have to build a new car in order to stay in the game. Paul Greifzu's first BMW Special, fitted with double rear wheels for its debut race at the Sternberg hillclimb in 1950. Helped by his brother Fritz, who in the meantime had become his companion in running his father's workshop at Suhl, and of course by his faithful companion Otto John, Paul Greifzu chose the chassis of a BMW 315 as a platform for his new race car, as this was less heavy than that of the 328. This was lowered, much lightened and fitted with "Intertyp" bodywork. This was delivered by Georg Hufnagel, who was involved in most of the race car projects in the GDR (just like Willi Huber was in the West). Besides that, the Greifzus received some aid from the nearby Eisenach factory, especially on engine development. With a standard 326 block as a base, which Greifzu regarded as more solid than that of the 328 model, EMW engineer Erich Koch developed a very competitive race engine by mounting the light-alloy cylinder head of the BMW 328 onto it. The car was completed in the spring of 1950 and after some brief test runs on the Autobahn Greifzu brought it to the first East German race of the season, the Sternberg hillclimb. This took place on the road from Zella-Mehlis to Oberhof, not very far away from Suhl. Thus Greifzu was able to return to his garage overnight and attach the double rear-wheel configuration after the cars of his main opponents had appeared in such a configuration for the first practice day. This effort paid out on race day, when neither Niedermayr nor Baum in their Eigenbaus were able to cope with Greifzu, who was able to record the first win for his car in its debut race. Naturally this success gave him the confidence he needed for his first circuit race at the Halle-Saale-Schleife and indeed he led from start to finish. 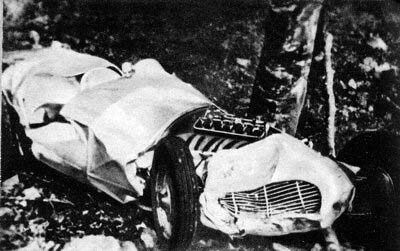 The wreck of Greifzu's car after the crash in practice for the German Grand Prix in 1950. After yet another win at Leipzig Greifzu felt strong enough to face more serious opposition. So he took his car on a tour through West Germany containing the Schauinsland hillclimb, the Solitude race and as a culmination the German Grand Prix at the Nürburgring. He did not really come to terms with the track at Freiburg, but at Stuttgart he was able to qualify for third position on the grid against a strong field of Veritas and AFM Formula 2 cars with most of the West German stars present. So it was again an impressive performance when he was able to maintain this position in the race until he had to retire with engine failure. This meant some more busy days (and nights) for him as he had only one week for repairs until the most important race of the season, the German Grand Prix. But it seems that this was insufficient for him to prepare the car properly, as he was plagued by engine troubles throughout all of the practice sessions. With time running out he probably pushed a little bit too hard in trying to set the required lap times and during his effort for a fast lap he could not keep it on the road. He crashed into the forest, sustaining severe injuries, after which he had to stay at the Adenau hospital for five weeks. Even worse, the car was reduced to scrap. Greifzu's new (rebuilt) car early in 1951. As soon as Paul Greifzu returned from hospital he began to build a new car for the 1951 season, which was based on the experiences of 1950. In fact it was based not only on experience, but also on parts of its predecessor which were still usable. But despite that it has to be regarded as a completely new arrangement. For example the cockpit moved much more towards the centre of the car, which was no longer useable as a sports car, but now intended as a true (but of course still offset) single-seater. This is confirmed by a look at the picture, on which it is clearly visible that only a fragment was left from the "passenger" door, which had been required under sports car rules only. Besides that, the whole front of the car was new with the engine mounted much lower within the chassis plus a new radiator, new suspension layout and a much improved engine representing the progress that was made compared to the 1950 design. The car was not ready in time for the first race of the season at Halle, so Greifzu was offered a drive in the DAMW of the new Rennkollektiv Johannisthal. But these cars were plagued by teething problems, too, and so he certainly was glad to bring his own car to the start for the next race, which took place around the Stadtpark ("city park") of Leipzig. But after a delay at the start his engine ran on five cylinders only. With this handicap he was very lucky to finish the race in second position behind Rosenhammer's new Kollektivwagen, but besides that Greifzu was very pleased with the car's excellent roadholding. So he had enough reason to be very confident for his journey to the 1951 Eifelrennen at the Nürburgring, the place of his accident during the previous season. And indeed he led briefly during the early stages and finished in a strong fourth place, best of the East German participants and even in front of Toni Ulmen, the West German champion of 1950. Back in the GDR again, at Dresden, he had to face opposition from the Rennkollektiv, but again showed one of his epic performances. During the first lap of the race he was involved in the pile-up mentioned before, when he was rammed from behind by the hyper-motivated Rosenhammer in the DAMW. Ortschitt in the second DAMW was too fast to avoid the accident and took himself and also Krause out of the race. With the complete Rennkollektiv already eliminated only Greifzu was able to continue the race. After a brief examination of the damage he jumped back into the cockpit and took up the hunt at the back of the field. He clawed back position by position and when Klenk's Veritas Meteor dropped out he found himself back in the lead, where he also finished, a whole lap in front of second-placed Ernst Klodwig, an outstanding performance underlining his position as the GDR's leading driver! 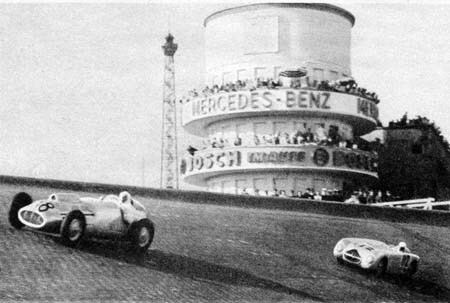 Greifzu in his Eigenbau, closely pursued by Ulmen in the Veritas streamliner, heading towards the greatest victory of his career at the banked Nordkurve of the Avus. In 1951, after fourteen years of rest the famous high-speed Avus circuit was revived. As its former southern part reached well into the Eastern Zone the track had to be shortened to 8.4km, but the famous banked Nordkurve was still part of the race. Paul Greifzu appeared there as a hopeful outsider among the elite drivers from both Germanies and also some international entries, among them a full HWM works team with Stirling Moss and Lance Macklin and Rudi Fischer in his V12 Ferrari. But Greifzu had done his homework again. With selected parts he had carefully built up an engine, which could rev just a little bit higher, and he also chose a special "Avus" transmission in the gearbox. Thus prepared he sensationally set the fastest time during the first practice session. He missed out on the second day of practice in order to make further improvements to the car, but his time was still good enough for a second row position on the grid behind the Veritas Aerosaurians of Rieß, Helfrich, Peters and Ulmen, despite the big top-speed advantage of these cars over the open-wheelers. Powered by the extra torque of his engine Greifzu shot into the lead right at the start, closely followed by Ulmen. This developed into the battle of the race as the rest of the field soon began to drop behind. Lap by lap the two leaders increased their speed, with Ulmen only briefly in the lead, but generally keeping himself behind his East German rival for tactical reasons. The plan was to spare the engine and benefit from the slipstream in order to shoot out of it for the final dash to the line. But in the end it were Ulmen's alleged advantages, the slipstream and the streamlined bodywork of his car which turned out to be pernicious for him, as he had to be just that little bit harder to his tyres while breaking for the South curve behind the other car lap after lap and the lack of airstream under the all-enveloping bodywork prevented them from sufficiently cooling down again on the straights. So with only a few laps to go Ulmen had to visit the pits in order to change tyres. Despite this was achieved in only 22 seconds, certainly quite a record for the time, the battle was of course over and Greifzu crossed the line sensationally some 44 seconds ahead of him with Fischer in the Ferrari yet another minute behind. 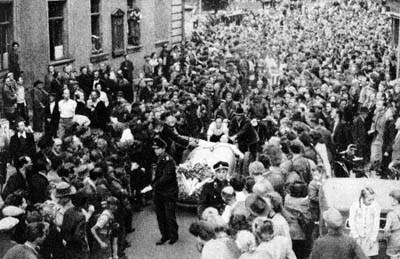 Paul Greifzu's return to Suhl turned into a triumphant procession through the streets of his home town after his famous Avus victory in 1951. With his surprise victory at the Avus Paul Greifzu's name soon became known all across the country. Of course it was a shock for the West German public, who had regarded their part of the country to be much more advanced in technology. Now they found their heroes beaten by an East German amateur. This fact was of course broadly exploited by the East German press. Overnight Greifzu had developed into a national symbol, well-suited to give the people of this small young republic something to identify with and to build up some confidence into the ability and the future of their state. A West German magazine even expressed some fear of East German predominance in conjunction with a cry for a public financial support programme! But it soon became clear that things would not develop to be as critical as feared. Already at the Schauinsland hillclimb the West German aces Pietsch, Stuck, Rieß and Ulmen were able to strike back and Greifzu finished only in sixth place. After that he achieved an easy win on home ground at the Halle-Saale-Schleife against weak Eastern opposition before he returned for the final race of the West German season at the Grenzlandring. This second high-speed circuit was of very similar character to the Avus so there were again high expectations on him. But in that race he was clearly overshadowed by Stuck in the AFM-Küchen before he dropped out with an engine failure. At the Sachsenring in 1951. The 1951 season ended with the race at the Sachsenring, which was clearly the climax of the East German series. In the previous season Ulmen had taken the winner's laurels away to the West, but now, with the East German challenge under way, the race was built up to another Battle of the Systems, of course accompanied by many paroles claiming "fair sportsmanship", "peaceful competition" and "international friendship". With this background it was a question of honour for the top drivers to appear here, of course for the East Germans, but also for some of the West German top drivers. Thus the front row was made up by pilots of the calibre of Hans Stuck, Toni Ulmen – and Paul Greifzu. This trio left the start line in exactly that order until Ulmen had to retire on the fifth lap. Grenzlandring winner Hans Stuck was again firmly in the lead, already some 30 seconds in front, when disaster struck – tyre failure! – and that left Greifzu to win the race. Of course this second big victory of the season was a welcome occasion for the East German press to refer to the quality of the Riesa tyre production – clearly an indication, that the GDR's technical standard was not as bad as was sometimes portrayed. Maybe what the racing efforts really suffered from was the bad supply organization behind it, a consequence of a long row of planning failures, about which more and more complaining articles appeared in the East German magazines of the time. But Greifzu showed them what was possible yet if one only worked hard and diligently enough. Of course he won the East German title very clearly, which had been introduced in 1951 for the first time, and if there had been an All-German championship he would certainly have been one of its strongest applicants that season. Very much an outstanding achievement for a driver on such a privateer basis! An interesting overhead picture of Greifzu's car, taken during his last race at Bernau in 1952. In 1952, now aged 50, Greifzu seamlessly connected to his successes of the previous season with an outright win in very wet conditions at Rostock. Only at Bernau he would be sobered down again a little bit, when he had to retire with clutch problems there after he had again led the first stages of the race. After the race he announced that he would not appear at Dessau in order to prepare himself for the upcoming Eifelrennen a fortnight later. So it was quite surprising when he turned up nonetheless, explaining it as a moralistic duty to compete when the West German elite was also there. This remark would be later utilized by the West German press, which suggested that he was actually forced to start by the "East German rulers, to whom propaganda is more important than human life", while Greifzu himself was said to have tried to refuse. This time this was no less then propaganda from the West, as even in the case of Greifzu not having started voluntarily, there was certainly no intention to the drama that would occur there. Sorry end of a great driver: The Greifzu wreck after the fatal accident at Dessau in 1952. When practice began Greifzu waited until Rieß, his main opponent, passed by before he entered the track himself, probably with the intention to compare the potential of his car against the Veritas. After two laps he was already in front of the West German and on the third lap he set the fastest time of the day. Then on the fourth lap it happened: Entering the long straight his engine suddenly seized with a bang. A thick cloud of smoke covered the spinning car, that crashed into a grandstand, fortunately without hurting anybody else. When looking at the picture the car seems to be in much better shape than after the Nürburgring crash two years before, but Greifzu, the great East German hero, was dead. Whether this was caused by the impact of the crash or by the push of the seized engine could never be confirmed with final certainty. It was a sad day for motor racing in the GDR. 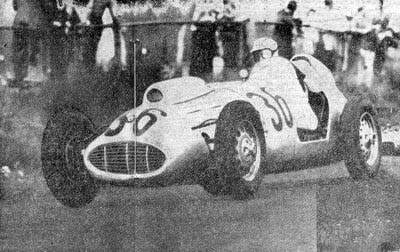 Rudi Krause at his debut in the Greifzu car, Halle 1953. But the Greifzu story is not finished yet. Dora Greifzu, his widow, took the car back home and together with their mechanics it was built up again. Whether she did it in memory of her husband or because she was "persuaded" by some functionaries is an issue that does not unfold to me yet, but at least it would have been a great dissipation not to bring the GDR's hottest machine to competition anymore. But it seems that the Greifzu was not very lucky for its other drivers as Kohlrausch, after finishing fifth at Dessau, died from a heart attack during a trip to the West only a few months later. Meanwhile yet another driver had taken Greifzu's seat in the cockpit. Rudi Krause finally recognized that his faithful Reif-BMW did not have the potential to compete at highest level and right here, at Dessau, he came to an agreement with Dora Greifzu to get the drive for the race at Halle. In his debut in the car he finished a solid third, also setting a new lap record for the circuit. 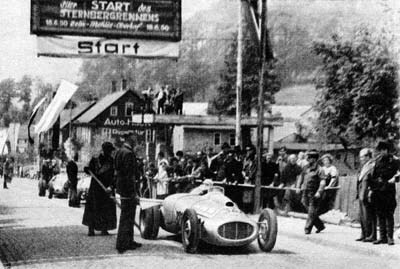 So Krause was maintained for the race at the Avus, the place of Greifzu's greatest victory. But the track didn't behave so kindly this time and Krause had to retire early with a leaking radiator. 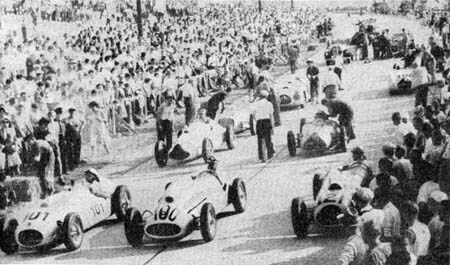 The climax of the 1953 season was of course the German Grand Prix, the only World Championship event in which the East Germans had a chance to take part, as they were prevented from travelling to other countries due to obscure "passport difficulties" (as the East German racing magazine Illustrierter Motorsport wished to call it). So no wonder that they appeared in strong formation: Edgar Barth in the car of the EMW Rennkollektiv, Ernst Klodwig with his interesting "Heck" Eigenbau and of course Rudi Krause in the Greifzu car, too. They could not expect to have any chances against international opposition at the highest level, arriving in the form of full works teams from Ferrari, Maserati, Gordini, Connaught and Cooper. But what they realistically could aim at was yet another impressive performance against the West Germans, who were gradually losing ground on the international elite at that time. So Krause was very content with qualifying sixth fastest among the Germans, 26th overall. The race itself began in a very exciting fashion for him, because just at the moment when he attempted to pass Helfrich his car suddenly began to toss and he could only narrowly avoid a spin. The reason for this soon became obvious to him when he noticed that the side door of the car (which was a reminiscence to the original 1950 design, when the car had been intended for sports car racing as well) had fallen off and jammed the rear wheel. With bleeding hands Krause succeeded in removing it from the car and set off behind the rest of the field. But, according to his autobiography, he had already lost some five minutes because of the incident. So he had reason to be content with at least arriving at the finish, only two laps down to Farina in his Ferrari, while most of his fellow countrymen did not even make it to the final flag. At the Sachsenring, the last of the big races of 1953, the Germans were among themselves again and Krause managed to lead during the first laps before he was overtaken by Barth in the EMW. But at least he could defend himself against the attacks of Hans Stuck and keep his second place until the finish line. Then the final race of the season at Bernau was again disappointing for him, but Krause had already collected enough points to become runner-up in the GDR championship. The Greifzu team prepared some further chassis improvements during the winter of 1953/'54 as Formula 2 was prolonged for another year in the GDR in spite of running out internationally. As a consequence the series turned into a reservate for antiquated machinery, marked by poor starting fields and generally low competition level, with not even the Rennkollektiv taking the formula very seriously any more. So it was an easy walk through for Krause at Dresden after Barth in the works car had retired. The next race, which was scheduled for July at Dessau, could not even be held as the track had been overflown by the high waters of the Elbe river and the event was postponed to September. This led to a huge gap in the calendar until the race at the Halle-Saale-Schleife in August, where only seven cars appeared for the start. Krause had qualified for pole position and after two laps he had put enough distance between him and the other competitors to remain unchallenged to the finish. At the Sachsenring he suffered from engine problems, so victory fell into the hands of Laue in the Kollektivwagen with Krause coming in in second place. After that the race on the Autobahn at Dessau was cancelled completely, vehemently disputed, as at the same time the Leipzig fair took place and the officials were afraid of a traffic chaos. 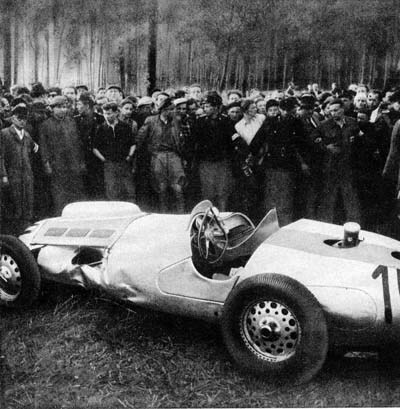 The final event at Bernau developed into a sad end for the season (and the "first" Formula 2 altogether) when in the concurrent 1500cc sports car race West German Richard Trenkel lost control over his Porsche and killed three race officials. The race was stopped immediately and according to Krause's autobiography no points were rewarded. A strange rule specified that points had to be allotted separately for works drivers and privateers that season so his results would have given Krause a strong lead in the championship. 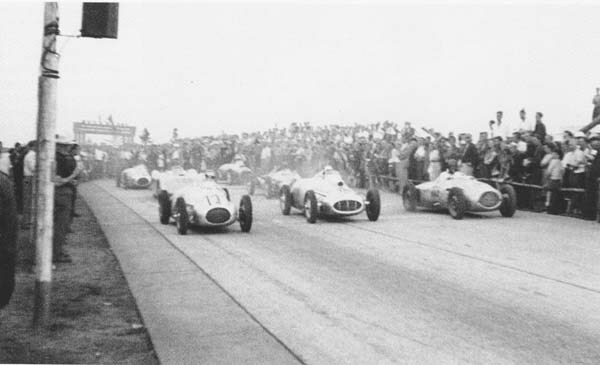 But there was another rule according to which the distribution of points depended on a minimum number of entries in every race, and there was also a required number of races which had to take place before the title was awarded. So at the end of the season Krause could not be declared champion officially, but had to be content with the unofficial title of DDR-Bester ("best of the GDR"). The bonnet is lifting on Rudi Krause's old BMW 328, photographed at the first race in East Germany after the war, Dessau in 1949. In the ranking of East German privateers Paul Greifzu is certainly followed by Rudi Krause, as these (neglecting Kurt Baum, who had been without any serious opposition initially) were the only ones to challenge the drivers of the Rennkollektiv on some occasion and actually being able to win some races. This was expressed in a very symbolical way, too, when Krause was offered the cockpit of the GDR's most successful car after Greifzu's death. The main difference between them was on the engineering side. Not to say that Krause did not have technical comprehension – drivers of that time were usually quite good mechanics and Krause's father had been a blacksmith at Reichenberg in Saxony, where Rudi grew up - but of course none of the driver-mechanics of that era could match Greifzu in their discipline. In contrast to Greifzu, who had done most of the technical development of his car by himself, Krause always seemed to have concentrated much more on the driver part. But besides that his biography reads quite similar to Greifzu's: Born shortly after the centenary both started on motorcycles in the twenties before they switched to self-modified sports cars at the beginning of the thirties. And, just like Greifzu, Krause was one of the earliest owners of the fabulous BMW 328, in which he participated preferably in hillclimbs before the war. The car survived the war better than its driver, as Krause sustained a head injury in a bombing attack on Chemnitz, from which he would suffer from time to time in his further life. 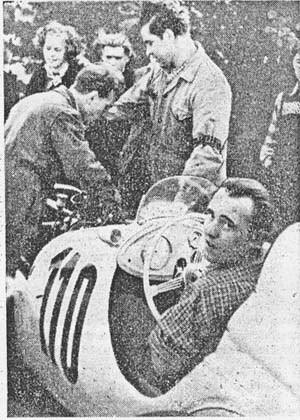 But this did not prevent him to appear with his DKW motorbike at the first post-war race at the Avus in 1949 and shortly afterwards even winning a race at Stralsund. During the weekend at Dessau he started in three races, the 250cc and 500cc motorcycle class and for the first time with his BMW 328 again. In spite of an engine bearing failure Krause had breathed racing air again and soon after he decided to convert his sports car into a pure racer. The Reif-BMW driven by Rudi Krause. Event still unknown. Krause approached engineer Reif, who was running a BMW garage at Karl-Marx-Stadt, the former Chemnitz, and asked him for his aid with the engine development. The result were a new cylinder head and new carburettors, and after some hard searching in local scrapyards a second such engine could be built as a reserve. The chassis was prepared at Krause's own workshop at Reichenberg. The intention was to build the car as short, light and low as possible, so the engine was moved back within the tube section frame and the water and oil radiators installed in front of it. In order to improve traction and weight distribution the driver's seat was placed closer to the rear axle. The suspension parts remained all BMW standard, but the front track was narrowed and the rear spread for better roadholding. The light-alloy bodywork was ordered by a local specialist and Krause had decided for the common Intertyp layout. Interestingly it consisted of two shells, an lower and an upper one, which were connected around the waistline of the car, very similar to the design of the 1951 DAMW, resembling drop-shape wherever possible. After completion it turned out that Krause's body jutted out too much into the airstream, so that too much suction developed behind his back. To prevent this a scoop was mounted onto the bodywork behind the cockpit later. Finally, after nearly a full year of hard work, the car was ready and Krause proudly took it to the race at the Leipzig city park. But neither there nor at the Sachsenring he was able to cross the finish line but he tells that at the latter event he had an interesting battle with the later winners, Ulmen and Rieß, both from West Germany. This picture, taken at the Sachsenring in 1951, makes the design principles of the Reif-BMW clearly visible: Low chassis with upright driver position, reaching well into the air-stream above the car. Around the side of the car you can see the line where the upper and bottom parts of the bodywork are connected. The 1951 season started promisingly, when the Reif lasted the whole distance of the minor race at Halle, while the two brand-new DAMWs of the Rennkollektiv did not. At Leipzig Krause even managed fastest practice time, quite remarkable against East German greats like Rosenhammer and Greifzu. In the race he fought a fierce battle for the lead with the DAMW works driver until his brakes failed completely. The car was launched in the air, overturned three times and then luckily landed wheels-down in the straw-bales, which prevented car and driver from sustaining major damage. As if this had not been enough excitement Krause had yet another big moment in the next race at Dresden, when he was (innocently, if we can believe his autobiography, which of course does not excel with exaggerated modesty) involved in the notorious accident with Greifzu, Rosenhammer and Ortschitt and found himself out of the race even before the first lap had been completed. After that he took his car to Berlin for the re-opening of the Avus track, his first start outside the GDR - but strictly seen not in the West as the East Germans still refused to accept West Berlin as a full part of the FRG. Alas, he conceals this event in his book, so little more than a laconic DNF is known about his performance there. In the second race at Halle that year he had to fight against technical problems during all of the practice sessions. Not able to achieve a single timed lap he was lucky to be allowed to start from the back of the grid. But against the usual mediocre East German opposition he easily worked his way up into second position, thereby setting equal fastest lap time together with Greifzu. After that his season ended with yet another DNF at the Sachsenring, plagued by a flat tyre first and then also by severe gearbox troubles. 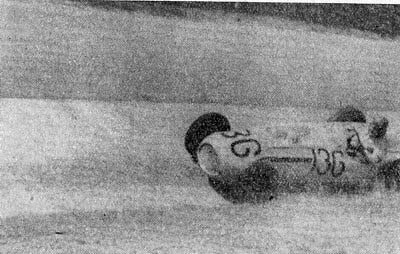 Rudi Krause at his first appearance in a world championship event during the 1952 German Grand Prix. The new year began in total contrast to the start of the previous season for Krause, as he was not able to complete a single lap during the whole weekend at Rostock. But his bad luck there should be more than compensated by the second victory of his career at the new Bernau track. Next was Dessau – Greifzu's fatal weekend – where Krause was able to come back into third place at the end, best East German driver, after having been badly delayed by an opponent who had stalled his engine at the start-line. 1952 was the year when the big international events were run to Formula 2 rules and Krause took his chance, together with Ernst Klodwig, to become the first driver from a socialist country to race for world championship points in the German Grand Prix at the Nürburgring. It seems that he must have had a very good start there as he came back from the first lap in twelfth position, fourth among the local boys behind Heeks, Rieß and Niedermayr, after having started only from the seventh row, 23rd position on the grid. According to his own report of the race he was able to fight his way up as high as into ninth place later before his clutch quit duty and he had to retire on lap six. The rest of his season was marked by retirements and DNAs before he was able to add another result to his scoreboard, a distant eighth at the Avus. Yet another unidentified picture in Krause's book. Any ideas about the where and when? The 1953 season started rather promisingly at Chemnitz, where after the retirement of Barth in the EMW the way to an easy victory was open. But at Dessau a cylinder failed and Krause was lucky to be able to coast to the finish in third place. This was the event during which Krause was introduced to Dora Greifzu and at Halle he already appeared in the cockpit of the Greifzu-BMW, the Reif resting at home in Krause's garage. Alas, nothing more is know about the fate of the car. The Reif cars of Krause and Niedermayr (see the article on the West German specials) are still a mystery to me. Regarding Niedermayr's good connections to East Germany it might be possible that his car was built at Reif's garage at Chemnitz. But reading Krause's book it might also be very probable that Reif was only responsible for the engines, while chassis and bodywork had to be contributed by the car owners themselves. Also the number of cars that carried the "Reif" badge is uncertain. It seems certain that Krause's car was a new one, built in his own garage during 1950. Niedermayr had appeared in his car as early as in 1949 (perhaps the car that had been driven by Brudes before?). Later, in 1951, Niedermayr made his entries for a car called "BMW-Meteor". But of course this could also have been only a simple name change to conceal the East German origin of the car. 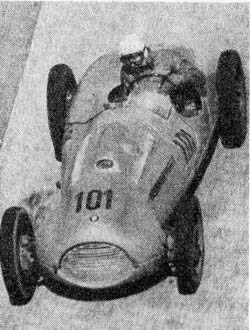 At the Sachsenring in 1951 Krause appears on the entry list even twice: In the Formula 2 race with his usual "Reif-BMW" and in the sports car race with a car called "Reif/Meteor"! This seems to indicate that there were at least some connections to Niedermayr's car. 2.10.1949 Köln F2 Helmut Niedermayr Reif-BMW dnf? 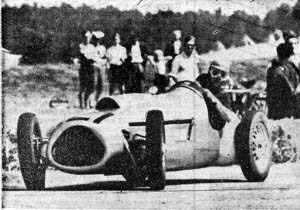 14.5.1950 Hockenheim SC Helmut Niedermayr Brudes / Reif - BMW dnf? 9.7.1950 Leipzig / GDR F2/SC Helmut Niedermayr BMW ? F2/SC Rudi Krause Reif-BMW dnf? SC Helmut Niedermayr Reif-BMW ? 9.9.1951 Grenzlandring F2 Rudi Krause Reif-BMW dnf? SC Rudi Krause Reif/Meteor (!) ? 6.10.1951 Dresden F2 Rudi Krause Reif-BMW ? After 1951 Niedermayr appears only on Veritas or AFM cars, while Krause kept his Reif-BMW well into the 1953 season. The strange look of his car certainly helped Ernst Klodwig to become one of the few German special builders not to disappear into obscurity. This picture shows him behind the steering wheel of his "Heck-BMW" during the German Grand Prix of 1952. Ernst Klodwig from Aschersleben appeared with this rather unique looking Eigenbau at the last race of the 1950 season at Dessau. Looking at the picture the chassis and suspension configuration remind strongly to the Volkswagen, so this had probably been used as a base (very similar to Polensky's Monopol), while the engine was of course of the usual BMW 328 model. As indicated by the word Heck (which simply means "the rear") this was one of the few pre-Cooper cars following former Auto Union tradition with the engine mounted behind the driver's back. Certainly this helped much to keep the design simple besides promising better weight distribution towards the rear axle. In this first race Klodwig finished second and from then on he remained one of the pillars of Formula 2 racing in East Germany during the next three seasons. And while his car perhaps was not one of the fastest machines, it at least showed an amount of reliability that was much above the average level, which certainly helped Klodwig a lot to achieve many of his good records in the series. 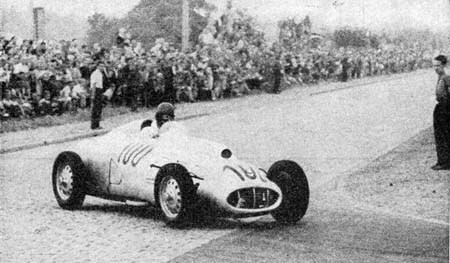 Klodwig scored another second place in his next race, the 1951 season-opener at Halle, and his impressive series of podium finishes was continued at Leipzig (3rd) and Dresden (2nd before it ended with a retirement at his first race outside the GDR at the Avus in West Berlin. But back to East Germany this was soon made forgotten again by yet another second at Halle and finally a fourth at the Sachsenring, which resulted in a firm second place in the final standings of the championship that year. With the competition getting tougher he lost a little bit of ground in 1952, recording only two podium finishes at Leipzig (2nd) and at the Sachsenring (3rd), which surprisingly were good enough to become vice-champion again. Certainly more important to Klodwig was his journey to the German Grand Prix (as some rumour goes he drove the car to the Nürburgring on its own wheels! ), where he was one of the first two East Germans to take part in a world championship event and the first one to appear in the result lists, classified in 12th (and last) position, four laps down on the winner. Later he took part in the race at the Avus again, too, where he finished seventh, this time only second best of the East Germans, beaten by Rudi Krause. 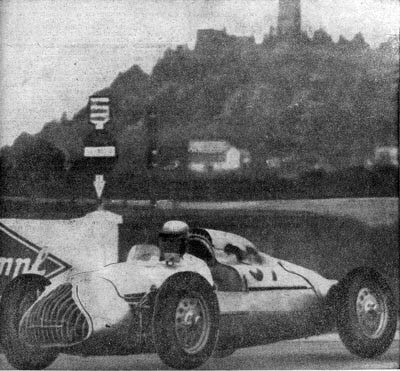 East German Klodwig in front of the Nürburg, taken during the German Grand Prix of 1953. In 1953 Klodwig continued his policy of taking part in as many races as possible, no matter whether they were held in the East or the West. But it seemed that his car was not as competitive as before, which of course had its effect on his results. So the best he could achieve was a couple of fifth places in the East German series at Halle and at the Sachsenring. In the races held in West Germany he at least showed his notorious reliability again, finishing seventh at his obligatory race at the Avus while in his second Grand Prix, where the above picture was taken, he succeeded in leaving one classified competitor behind him, arriving in 17th place at the end. At the start of the Sternbergrennen, Zella-Mehlis in 1950. About to start is Paul Greifzu, making the debut of his famous special. Third car at the back is Kurt Baum's BMW Eigenbau, fitted with double rear wheels like the Greifzu for this hillclimb event. Alas, little more than some pure race results are handed down of this remarkable car, the very first of the East German Formula 2 specials and obviously a true monoposto. I could find only this single picture in my archive, on which - if only sketchy in the background - the car at least appears. So to give a better impression of the car I add this picture, which I found somewhere in the internet, which is a proof, that this very historical car has been preserved until today in its final 1951 shape. Kurt Baum's BMW Eigenbau today. Kurt Baum from Hainspitz in Saxony is reported to have built this car as early as 1947, but he doesn't appear in my records before the race at Dessau in 1949, which was the first event in East Germany after the war. After that Baum finished second at the Sachsenring in the same year and again second at Leipzig in 1950. A third at Dessau in the same year seems to have been his last countable result, while after Leipzig and Dresden in 1951 he does not seem to have raced in Formula 2 any more, concentrating on the minor sports car classes, where he had already become two-times East German champion, driving yet another Eigenbau in 1950 and the DAMW factory car in 1951. Kurt Straubel in his very handsome BMW-Eigenbau on his way to second place at Dresden in 1953, which would become his greatest success in Formula 2. When the story of East German early post-war racing is told this simply can not be done without mentioning Kurt Straubel. This is not only due to the fact that he was one of the faithful supporters of the series with his BMW special all from the beginning to its end, but also because of his initially successful membership of the Rennkollektiv Johannisthal. Of course he had been at Dessau in 1949, where he helped to bring East German motorsport on its feet by taking part in the race for the 2-litre sports cars. In 1950 he even became first champion of the GDR in that class, and consequently was asked to join the Rennkollektiv for 1951. Driving the state-owned team's sports cars still allowed him to enter the Formula 2 events with his own car, but of course not with the same level of attention. As a consequence he didn't achieve any serious results in the category while he won his second and third consecutive titles in the big sports car category on board of the factory cars in 1951 and 1952. Straubel's greatest success with his Eigenbau was a second place at Dresden in 1953, really a moment worthy enough to take a picture. 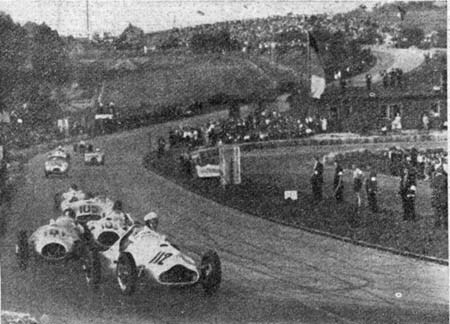 The grid at Dresden in 1953. Besides Barth in the EMW (101) and Krause's Greifzu-BMW (100) this rare shot shows a huge collection of some very interesting cars: Completing the front row is Kurt Straubel's Eigenbau (121), while in the second row we see the AFM of Willi Heeks alongside Ernst Klodwig's "Heck-BMW";. With some probability the next car behind is Karl Wojciechowski's obscure single seater, as usually remaining as hazy as the monster of Loch Ness when photographed, while the last row on the grid is made up by the two Veritas cars of Adolf Lang (or Theo Helfrich?) and Heinz Melkus (106). All I know about this car in which Karl Wojciechowski campaigned the 1953 Formula 2 season, is a short reference in an article in Illustrierter Motorsport, where it is told that it had been already exposed at the Leipzig Fair as early as in 1950. There it became known as der weiße Traum ("the white dream"), a very appropriate name, as it is hard to find a well-focused photo of this car. According to the report Wojciechowski had bought the car thereupon and prepared it for Formula 2 racing in 1953. Whether he had already driven it before at his previous appearances in the 2-litre sports car category - at the Sachsenring in 1951, Leipzig in 1952 (finishing fourth) and again Sachsenring 1952 - is not known to me, as his car is simply called "BMW" in all those entry lists. What's certain is that he brought the car to the races at Chemnitz, Dessau and Dresden in 1953 but it seems that he never saw the finish line on any of these occasions. Finally at the Sachsenring Wojciechowski is reported to have suffered a race accident in which the car completely disintegrated. Despite Wojciechowski's name appearing again in 1954 on the entry lists of the races at Dresden and the Sachsenring, it is very doubtful to me whether the car was actually repaired. This car is yet another mystery to me. It seems that it had been built and raced by Arthur Rosenhammer before his engagement by the Rennkollektiv. I am quite uncertain whether it was a standard Veritas RS or – as its name would indicate – a "customized" version. "ARO" very likely stands for the driver/owner's name, but in an article in the East German magazine Illustrierter Motorsport (in 1953) it is even stated that initially an Alfa Romeo engine had been installed! But to me this rather seems to be a misinterpretation of the abbreviation, as Rosenhammer's first car, a 750cc racer of the Kleinstrennwagen class - certainly no playground for Alfa Romeo engines - had already been called "ARO" when he appeared in it in 1949 at the Sachsenring. 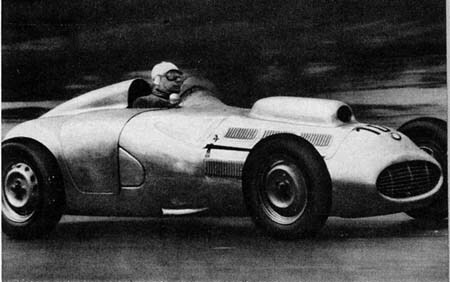 The ARO-Veritas' first appearance was in the entry list of the race at Leipzig in 1950, but it is unknown to me whether it actually did turn up there. 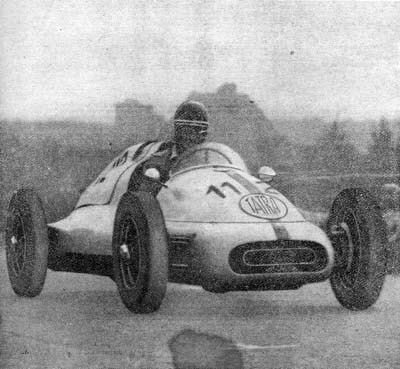 In 1951 Rosenhammer joined the Rennkollektiv, and early in the season at Halle Theo Fitzau drove a car into third place which was called "DRS-Veritas". According to a contemporary article these three letters stood for Der rasende Seifensieder ("The speeding soap boiler"), Fitzau being a soap manufacturer at Köthen. Regarding this social background it becomes clear why he obviously never really came to terms with the idea of helping to build up socialism and as a consequence he did not return from a trip to Rastatt in West Germany at the end of 1952, one of a quite a number of East German drivers committing the crime of Republikflucht ("escaping from the GDR"). While the East German press was still making jokes about Fitzau "starving" in the West - he seemingly had expected to get a Mercedes works drive in 1953 - the car was now handed over to Heinz Melkus and called "ARO-Veritas" again. 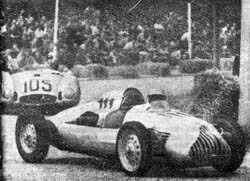 Melkus raced the car during the last two seasons of Formula 2 (now combined with the 2-litre sports cars) with a second place in the 2-litre sports car class at Leipzig in 1953 as his best result. Later he would become the leading race car manufacturer of the GDR, building cars for Formula Junior and Formula 3 throughout the sixties as well as Eastern Europe's only production series of a road-going sports car, the RS 1000. 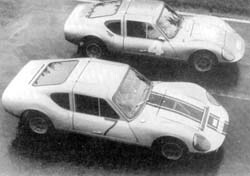 Two products of Heinz Melkus later activities as East Germany's manufacturer of competitive race and sports cars: The Formula 3 car of 1964 (left) and the Melkus RS 1000 (right). 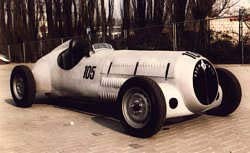 A remarkable curiosity: Illustrierter Motorsport reports that the ARO-Veritas appeared at the Sachsenring in 1953 with a air-cooled twin-cylinder four-stroke boxer airplane engine of French origin installed, Melkus showing some impressive practice laps! Scene from the race at the Halle-Saale-Schleife in 1953: Ernst Klodwig (Heck-BMW) closely followed by Karl Weber in the Werkmeister-BMW. Karl (or Carl?) Weber from Heiligenstadt was already racing an BMW-engined special of the 750cc race car category in 1950. In the Greifzu biography it is reported that he took part in the Sternberg hillclimb that year. 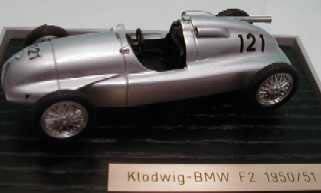 In the 1952 season he appeared again in Formula 3 races in an Eigenbau, called the Weiser-BMW. For 1953 he promoted himself to the Formula 2 class, using the very elegant sports car which can be seen on the picture. In Illustrierter Motorsport the car was called Werkmeister-BMW, but little more information is given about the car there. The combination Weber/Werkmeister-BMW was quite successful that season, starting with an impressive 2nd at Karl-Marx-Stadt (the former Chemnitz), followed by fourth places at Dessau and here at Halle, too. 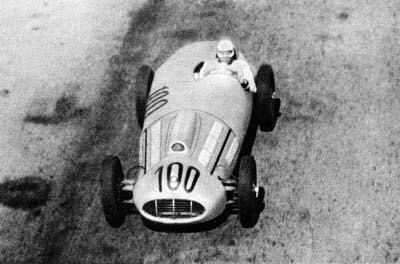 Then Weber had to retire at the Avus, but this was compensated soon by yet another finish, sixth at the Sachsenring. In 1954 Weber made entries for the races at Dresden and at the Sachsenring again, but I don't know if he actually turned up there. West German guest Willi Heeks in his Veritas Meteor (112) leads shortly after the start at Chemnitz in 1953 in front of Edgar Barth / EMW (101), Rudi Krause / Reif-BMW (103), Carl Weber / Werkmeister-BMW (105) and Ernst Klodwig / Heck-BMW. Already a gap opens up to Hans Winkler / Veritas RS, Karl Wojciechowski / BMW-Eigenbau and Heinz Melkus / ARO-Veritas. At the end of the field is Martin Janocha in his Eigenbau-BMW. Martin Janocha from Leuna made his first entries in 1951, for both races at the Halle-Saale-Schleife. Perhaps it was still the same car in which he appeared again after a one year's pause, here at Chemnitz in 1953. But Janocha saw the finish line neither here nor at the races at Dessau and the Sachsenring, after which the race report in Illustrierter Motorsport simply states that "Janocha will still have a lot of work to improve the car as well as his own driving technique", to which certainly not much is left to be added. 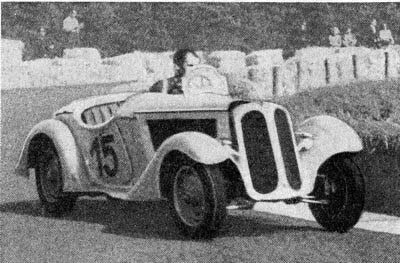 Whereas the picture above suggests that Hans Winkler from Weißenfels raced a Veritas RS (the rectangular radiator grille suggesting the former Rieß car), it might also have been yet another of the various copies of that design, as in other sources it is simply called "BMW-Eigenbau". Egon Binner in the cockpit of his car, not yet having any presentiments of becoming the last winner of a Formula 2 race in the GDR; Bernau, 26 September 1954. Very late Egon Binner entered the East German Formula 2 stage when he started with his BMW Eigenbau at the Sachsenring in 1953. Information is very rare, so it is not evident whether this was a completely new car or whether it had had other owners before. In one occasion the car is even designated to be an AFM, but in most sources it appears simply as yet another ''Eigenbau". With this car Binner recorded some acceptable results during this final season, among them a third place at Halle, before he accomplished to win the very last Formula 2 race in the GDR ever at Bernau, which was of course also a dignified end of the BMW 328 era. 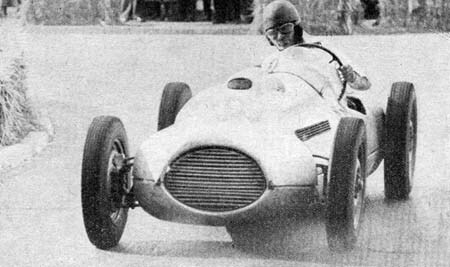 Before he turned up with the ARO-Veritas Fitzau had already appeared in a few races in another special which was called "Weber-Eigenbau" in the race programme at Hockenheim in 1950. 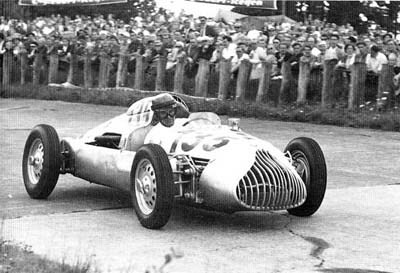 Helmut Weber was on the starting list of the 1950 races at Halle and Leipzig in his Eigenbau. 2-litre sports car raced by Erich Kubelka in 1950/51. Gerhard Erfurth ran this BMW-engined sports car in 1951 and 1952. Otto Reichardt's sports car in which he campaigned the 1952 season. At least Albert Veryser appears once on the results sheet of a race, driving his BMW special into second place in the sports car class at Rostock in 1952. 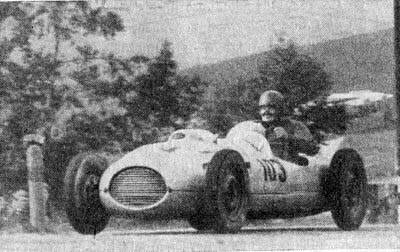 Paul Thiel finished second in the sports car class at the Kyffhäuser hillclimb in 1952 in a BMW-engined special before he was signed up by the EMW factory team in 1953. 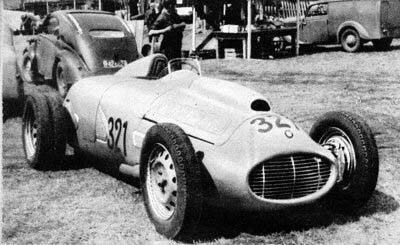 An obscure car in which Hans Althoff made an entry for the race at the Sachsenring in 1951. 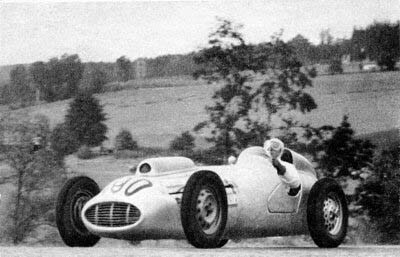 Werner Jäger's car is designated as "EMW 340/I" in the race programmes of 1952. This might indicate a standard version or a self-made conversion of the EMW 340 road car, which of course was the development of the BMW 328 by the Eisenach company. In 1953 Jäger became part of the Rennkollektiv, so no need to use his old car any longer. Willy Wolf won the sports car class at Halle in 1951 in a car which was simply called "BMW". So could this have been a standard BMW 328 model? Other drivers who started occasionally in a "BMW" were Helmut Zimmer (1951-'54) and Helmut Grauer (Halle 1951). Rare guest: Jaroslaw Pawelka in his Tatra adding some international colour to the Sachsenring race in 1953. When the Nesselsdorfer Wagenfabrik, named after its factory seat at the Bohemian town of the same name, built their first automobile according to Benz license it became a pioneer car manufacturer of former Austro-Hungaria. The company's long tradition in motor racing was founded as early as in as in 1900 when Baron Theodor Liebig won the Salzburg-to-Vienna race as well as in the La Turbie hillclimb in a 12hp car of that make. Then the Austro-Hungarian Empire was dissolved after World War I and Bohemia became part of the new Czechoslovakian state. Nesselsdorf was rechristened into Koprivnice (this is not a spelling error!) and the company adopted the more patriotic sounding name of Tatra, after the highest mountain of the country. With chief engineer Hans Ledwinka introducing a new series of small cars in 1922 the company rose to become one of the famous car manufacturers in Europe. In 1934 Tatra attracted public attention once again, setting a new trend by anticipating the Volkswagen concept with air-cooled rear engines and streamlined bodies even for their V8 engined luxury cars. This fashion was kept by the company for all their post-war designs, which were mostly used by Eastern Europe representatives up to the end of communism and finally led to the Tatra 613 limousine which was still in production recently. With this background history in mind certainly no one will be astonished that when Tatra came back to the race tracks in the 1950s the cars had air cooled V8 engines mounted in the rear, some five years before Cooper established this concept successfully in international Formula 2 and Formula 1 racing. The first time a Tatra appears in my records was at the race at Leipzig in 1950, where Czech driver Jan Mikel was entered in a car of that make. After that it became quiet again before Jaroslaw Pawelka took part in the race at Halle in 1952 with a new model, the T607, which was also known as Tatraplan. Strangely, it seems that for this a 2545cc engine was chosen, which of course was beyond Formula 2 rules and in fact would not even fit the upcoming Formula 1 of 1954. So strictly spoken these cars had to be regarded as Formule Libre cars, at best falling under the rules of the old 4500cc unsupercharged Formula 1 for which they gave away some 2 litres of capacity! But of course these circumstances were never published in the official sources, where the cars always were referred to as "2.5 litres", designed for the new 2.5 litre Formula 1! What made such a car appear in an East German Formula 2 event was certainly the fact that the East German officials wanted to add some international flavour to their local races, in which none of the drivers or cars from West European countries ever showed any interest in taking part. In the race Pawelka did not play a major role as he finished only seventh behind a good collection of BMW-engined cars from both parts of Germany. A few weeks later the Tatra's visit to East Germany was rewarded by Edgar Barth in the Kollektivwagen taking part in the Czechoslovakian Grand Prix at Brno, where this time Pawelka crossed the line first with Barth behind in second place. In 1953 Pawelka and the Tatra team made another visit to the GDR for the race at the Sachsenring, where the picture was taken. Of the nine starters six arrived at the finish and Pawelka was fourth at the end, not very impressive again regarding his 500cc advantage in engine capacity. 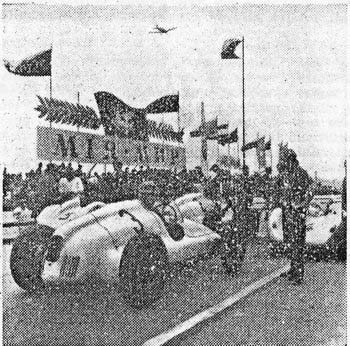 At the start line of the 1954 Czechoslovakian Grand Prix: Car No.3 in front is the Tatraplan of Jaroslaw Pawelka, the latter winner of the race. Car No.2 is a sister car while the No.4 and 5 machines alongside are the 1500cc sports cars of the EMW Rennkollektiv from East Germany. The final appearance of a Tatra within the covered period was at the Grand Prix at Brno in 1954. There Pawelka again succeeded in making his way against his opponents from the East German Rennkollektiv, who had brought along their newest sports cars of the 1.5-litre class.